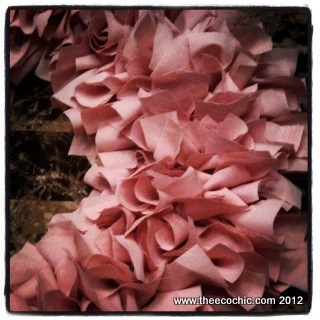 -Cut the fabric into equal sized strips. Our strips were approximately 1-1.5″ wide and 6-9″ long. 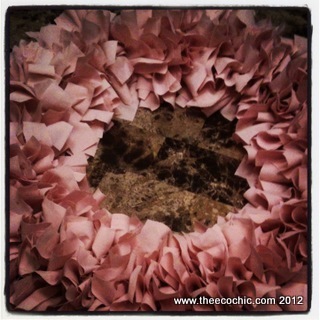 Be sure to cut the strips to about the same size or you’ll end up with an uneven looking wreath. 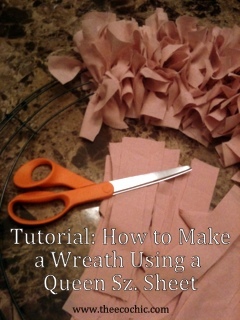 -Tie each strip onto the wreath form with a simple knot. I only tied a single knot but a double knot would prevent them from coming undone later. It’s not a piece that will get handled a lot so a single knot is fine for my purposes. -Continue tying strips to the wire wreath form working to fill in as much space as possible. The entire process took me a little more than an hour to complete (after the kids were in bed). It’s a good project to do while watching television of chatting with family and friends. -Embellish. You can add any additional embellishments if you like. Painted wooden or cardboard lettering would be cute hanging in the middle of your wreath with a coordinating ribbon. -Hang up and Enjoy! I used a simple over the door wreath hanger. You could even add a ribbon if you want it to hang lower. For more eco-crafting tutorials and tips check out my archives where I completed this project using old t-shirts on a much smaller scale. Have you completed a project seen here? Share it with me on Facebook. I’d love to see your pictures!